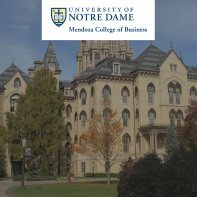 Please join us for an online information session to learn more about the University of Notre Dame’s Executive MBA program. You’ll hear from admissions staff and alumni of the program. The University of Notre Dame du Lac is a private, non-profit Catholic research university in Notre Dame, Indiana. Started as a small all-male institution in 1842 and chartered in 1844, Notre Dame reached international fame at the beginning of the 20th century, aided by the success of its football team under the guidance of coach Knute Rockne.